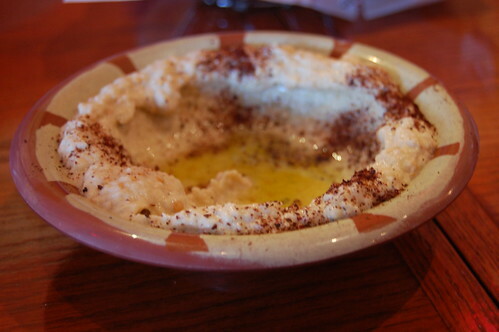 weezermonkey: Baba Ghanoush! Baba Ghanoush! 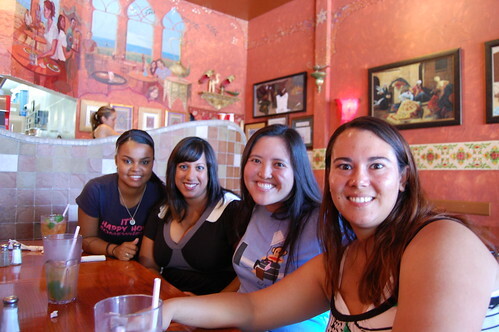 I had brunch at Open Sesame today with 10Years, CBB, Y_L, KP, Nessdogg, starlily313, and JD2B. 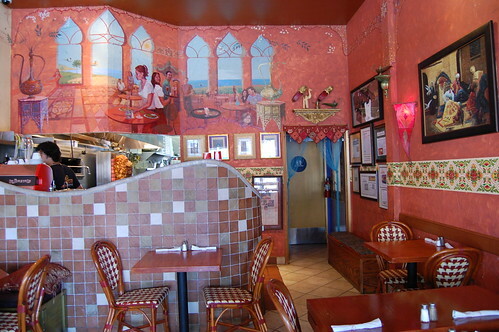 The decor was rich and colorful with a dash of kitsch. I love watching huge chunks of meat spin. 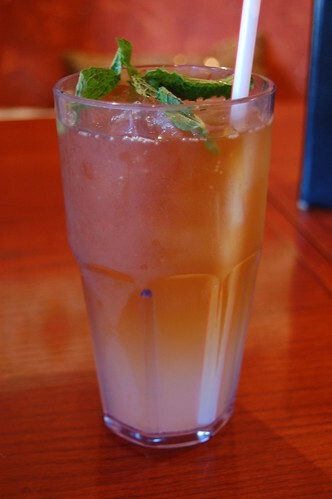 Open Sesame adds mint to a number of its drinks, even to my Arnold Palmer. Nice touch. Refreshing. And I don't even dig mint that much. 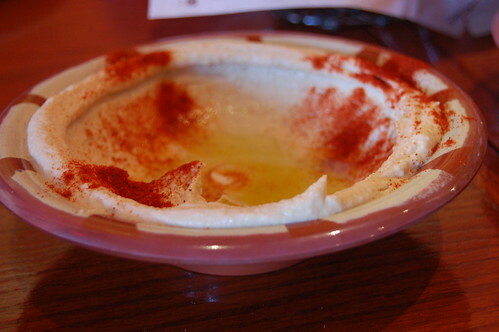 We started with some hummus and baba ghanoush for the table. Yummers. 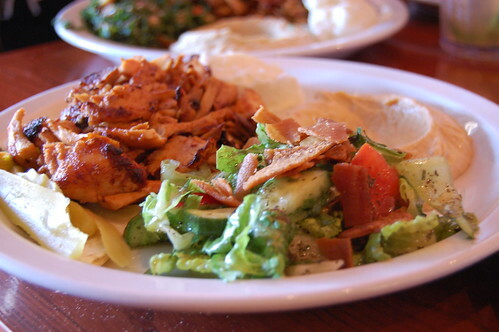 CBB had the chicken shawarma plate, which included tender thinly sliced marinated chicken, served with hummus, garlic sauce, wild cucumber pickles, pita, and a choice of salad. I had a bite of CBB's chicken and garlic sauce. Pretty awesome. 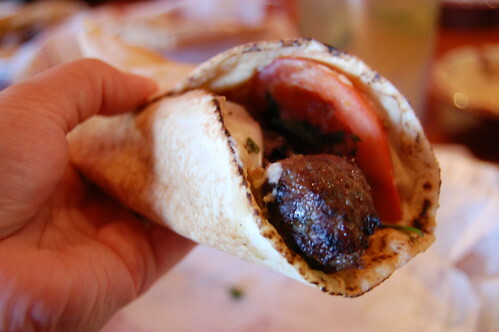 I opted for the kafta pita, which was a charbroiled skewer of ground beef and lamb mixed with parsley, onion, and Lebanese spices rolled in a pita with hummus, parsley, onion, and sumac. It was like happiness in my hand. Delicious. Please pay no attention to the fact that it looks like I'm holding poo in a pita. Best damn poo in a pita I've ever eaten. 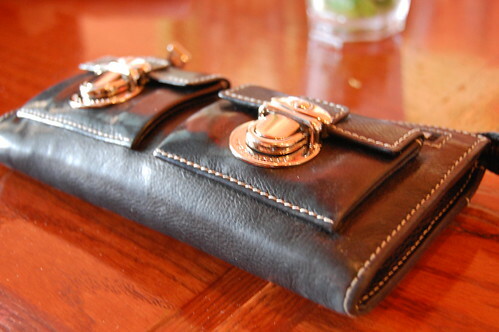 More deliciousness -- CBB's Marc Jacobs' wallet. I think everybody was quite pleased with their meals. 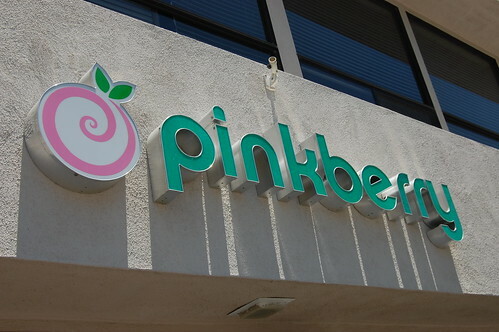 After brunch, we strolled down the block to get something refreshing for dessert. On our way, we ran into 10Years' secret side business -- a bikini store. And then we reached our destination. Mmm. Yogurt in hand, we walked along 2nd Street, chatting and enjoying the sun. 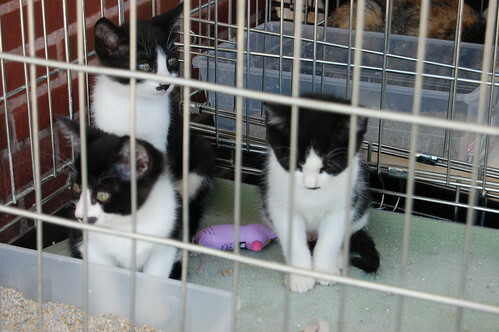 We saw some kittens for adoption. We went into this store, among others, briefly. Then I got a call from my dad. It was about his sister-in-law. It was sort of urgent but not super-duper-right-this-moment-urgent. I told him I'd call him back in an hour. After walking around for a bit more, I decided I should go home to call my dad, so I bid my buddies adieu. I had such a wonderful time. 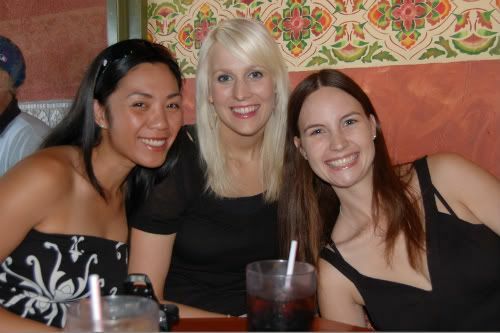 It was especially nice to meet starlily313 and JD2B. Thank you all for coming! so sad I missed what looks like a fab GTG! and I also really enjoyed the poo, it is pretty damn good. hope all is ok with papa monkey's SIL. 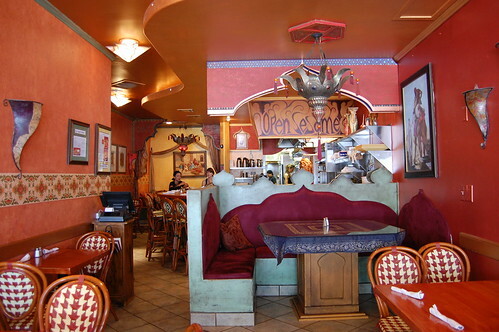 I love me some Mediterranean/middle-eastern food. Yum! 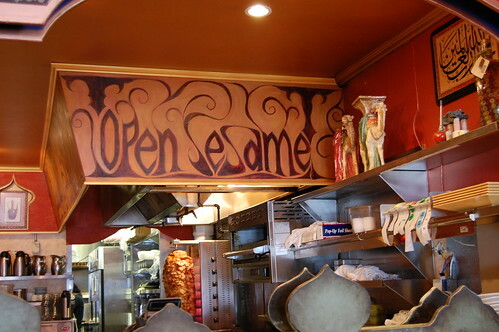 My mom used to say "Open, Sesame!" all the time when we were kids, whenever we were in front of a door. everything looks really yum. sad i missed it. such a pretty day for walking around, too! Have you ever heard the song "Nose Ring Girl" by NerfHerder? It's all I can think of when I hear or read "Baba Ghanoush" ha ha. 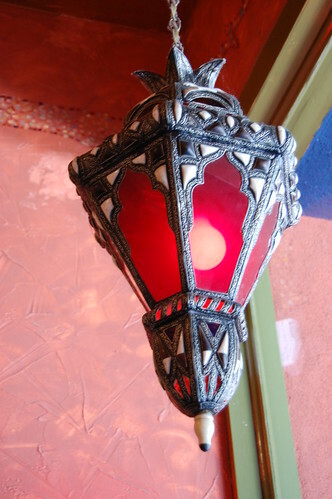 fiance and i have got to find a lebanese place in Dallas! 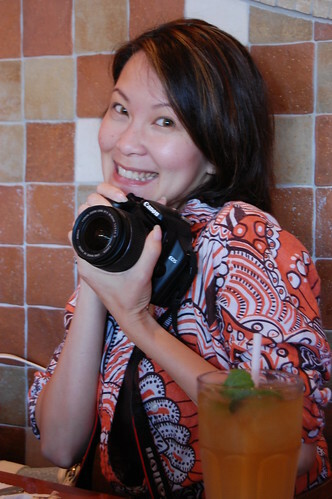 It's not good for me to read your blog late at night. I think I've gained at least 5 pounds because of your food pictures. 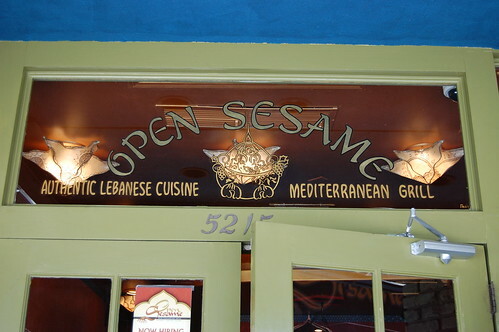 Wow, I MUST try Open Sesame! Looks amazing! It was nice to meet you too! Yesterday was a lot of fun. Hope all is well with your aunt. YUM. 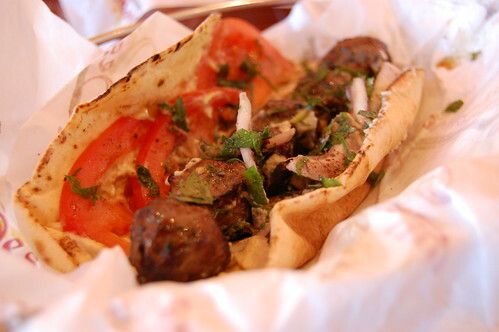 i now have a major craving for zankou. 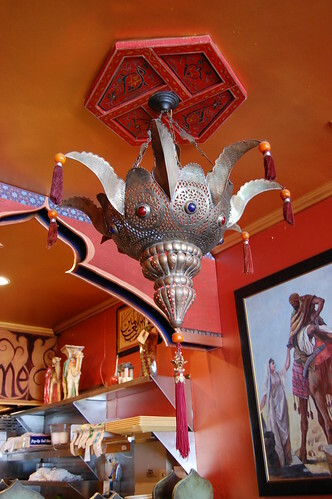 ;-) i adore the décor at open sesame, especially the houndstooth pattern upholstery on the chairs. awesome! Kittens! Poo in a pita! i'm so sad we missed this after all. timing. bad. poo in a pita looks interesting. i, too, hope all is well. i love hunks of meat too. poo pita's are da bomb! Your food pictures always make me drool. I'm sad I missed the GTG. Glad I got to sort of live it through your blog. Food looks delish! Thanks for the post! That was a super fun day. 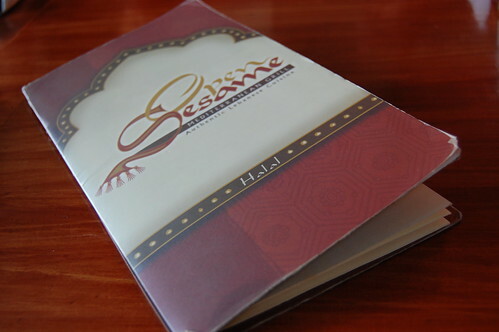 The food and company were Michelin rated in my book.